If your church is using the Bronze plan or higher for the TouchPoint Mobile App, you will have an icon on the app for Registrations. This makes it so easy for your members to sign up for your upcoming events. Once they log onto the app, they will be logged on to register. All they need to have is a user account in your TouchPoint database and the app downloaded onto their mobile device. Staff users (with Access and Edit roles) can manage their registrations, deciding if they want them to display on the app and, if so, in what order, under which Category, and whether to display the individual or the family. See section below for more about Managing App Registrations. If you are not using the TouchPoint Mobile App and are interested in it, you can read more about it in this article. Or you can get more information and register to take a tour of the app here - TouchPoint Software. 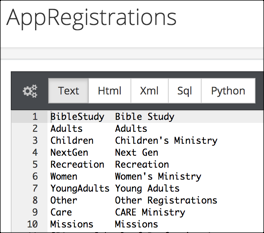 Categories are used within the app to group registrations by type or ministry. These Categories are stored in Special Content > Text Content in a file named AppRegistrations . If this file does not already exist in your database, as soon as the Registrations are turned on for your Mobile App, 2 Categories are created behind the scenes - Other and Registrations. The actual text file does not get created at this time. Therefore, your System Admin should add the text file and create the Categories you want to use following the instructions below. The line number (see illustration below) is the sort order, next is the name that will display on the app itself, and last is the longer name/description which will display on the Public View page when selecting another Category. You can move these around to place them in the order you want them to display on the app. Go ahead and create the text file before your registrations are turned on for your app. You can go ahead and assign the Categories to your online registrations, and then they will be in place when your mobile app registrations go live. This must be done by the user with Admin role and can be created before or after registrations are turned on for your mobile app. Go to Administration > Setup > Special Content and click the Text Content tab. Click the green +New Text File button and enter the name AppRegistrations (no space) and press Submit . Enter the first Category name (what you want the registrant to see on the app), click tab and enter the longer name/description (what you will see when editing the Category). See image below for a sample. Press return/enter and enter the name for the next Category. Continue as above until you create all the Categories you want. Press the blue Save Content button when finished. You can return and edit this file at any time to change the order or add/remove Categories. If a Category does not have any active registrations the Category name will not display on the app. You can add the Category Invitation Only to the AppRegistrations file and any registration with that Category will not display on the app even though the registration meets the other criteria. This would be used for online registrations for which you prefer to email prospective registrants, such as a Leadership Meeting that would be just for Life Group leaders, for example. Most of the management of registrations in regard to displaying on the app is performed on the Organization > Search/Manage page > Public View tab. Most of the management of the online registration itself is done on the registration organization. Go to Organization > Search/Manage and filter for Online Registration, selecting (Any Reg on App) . Then click the Public View tab. Now you can easily edit the settings listed below, selecting a Link Type, assigning a Category, assigning a sort order within the Category, and adding a succinct Description. Note: This Description is the same the Description you can edit on the org itself. Once you have completed that, change your filter to find (Any Reg Not on App) . Now you can look through those to decide is any of those should be displaying on the App and make any necessary changes to the registration org so they will display. See the Quick Troubleshooting and Facts about Registrations and the App below to help trouble-shoot if a registration is not displaying on the app and you want it to display. These 4 settings can be edited right there on the Organization > Search/Manage page when you are viewing the Public View tab. Select Individual to initially display only the person that is logged in. Or select Family to initially display all the family members of the person that is logged in. Click in the field to change the link type. Individual is the default. This is referring to what the person sees when they first click the Register Now button under the description of the registration on the app. These options will be whatever is in the AppRegistrations file in Special Content > Text Content. Click in the field to select a Category. See the section above regarding Categories. This determines the placement of this registration within its specific Category. Click in the field and enter an integer for the sort. A sort is not required for the registration to display on the app. If you have added a Description on the organization itself (Settings > General tab under Basic Setup), that description will display. However, you can click Edit on the Public View page and enter or change the description that you want displayed to those using the app. These settings are displayed on this page, but are not editable there. These are set either by a trigger (some condition has been met) or are set on the registration organization itself on the Registration > Registration tab. If either of these is true, the registration will no longer display on the app. These indicate that the org has either met its maximum, the Reg End date has passed, or someone has checked the box Registration Closed. To extend the registration, you will adjust the settings on the org itself. This will be either Join Organization, User Selects or Compute Org by Birthday. If the type displaying is No Online Registration, then, of course, this registration will not display on the app. First Date is the first meeting date selected on the Org. This date does not have any affect on whether or not this org displays on the app. The Reg Start and Reg End dates will affect when a registration will start and stop displaying on the app. The start date must be today or earlier and the end date must be later than the current date/time or the registration will not display. If your online registration is not displaying on the app either as Current or Upcoming, check these items. Registration must have both a Start and End Date. The org must not have a Reg Type of No Online Registration. The category must be something other than Invitation Only. If the registration does not have a Category, it is assigned the “Other” category. If the Start Date is null/empty, the registration will not display. The Start Date must be the current date or earlier to display on Current Registrations on the app. If the Start Date is in the future, the registration will display on Upcoming Registrations, and will move to Current on the Start Date. If the End Date is null/empty, the registration will not display. The End Date for the registration has to be greater than today. So, once the end date has past registrations will no longer display. The org must be ‘active’ not ‘inactive’. The org cannot have a Category of “Invitation Only”. These registrations will not display because this Category indicates that you will email a RegisterLink or RegisterLink2 to to those who can register. The org does not have to have an order. but if you want to control the order in which the registrations display within a Category, you can assign a sort order to those registrations.